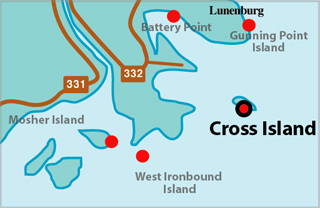 Cross Island, 90 feet (27m) high and wooded, divides the approach to Lunenburg Bay into two channels, of which the north one is encumbered with shoals and intricate, and the south channel wide and clear of dangers. 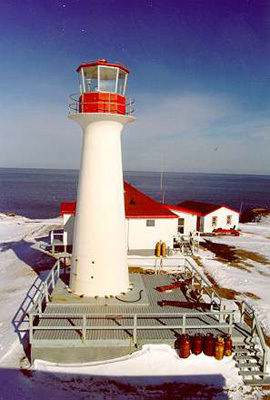 Cross Island light is shown from a white pyramidal tower, 38 feet (11.7m) high on the east point of the island (44.19N 64.10W). A fog signal of two blasts every minute is sounded from a horn close to the light; the horn points 164deg. Light Height: 100ft feet above water level. Tower Height: 067ft feet high. Light Height: 078ft feet above water level.